Few social movement organizations can equal the impact of the Jewish Labour Committee (JLC) in fighting discrimination. 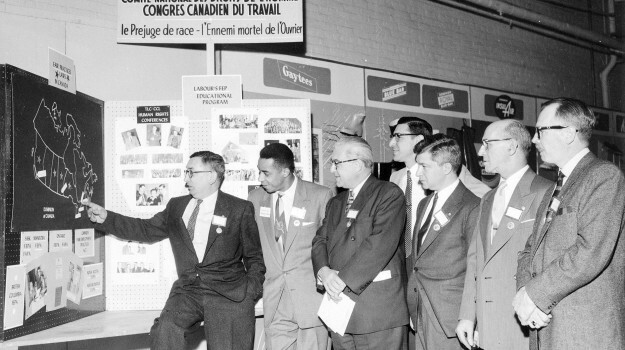 Such was its success that Frank Scott commented that he knew “of no single body in the whole of Canada doing as much continuous and consistent work for civil liberties.” Another noted civil liberties lawyer in the 1960s, Alan Borovoy, claimed that “every major effort to get civil rights legislation, most of the leading cases and surveys, have been organized and initiated by one of our labour committees for human rights.” For a brief history of the JLC, click here. The following links are a series of JLC posters produced for distribution in Canada. Some were designed by the American Jewish Labour Committee, which was headquartered in New York City. To view all the posters simultaneously on a single page, click here. The Atom Bomb Is Just a Peashooter Compared to This! “Typhoid Mary” Starts Her Day. Remember the Warsaw Ghetto Uprising. Meeting notice (28 May 1946). Meeting notice (9 April 1964). Meeting notice (19 April 1965). Meeting notice (19 April 1966). Meeting notice (19 April 1969). Meeting notice (19 April 1970). Meeting notice (Warsaw Ghetto Uprising, n.d.). Brief to the premier of Ontario, 1961. Case file samples, early 1950s. Fair Employment Practices: A Good Beginning. Flyer produced by the Jewish Labour Committee.